Hello everyone!! Here's the recipe I promised last time using the NuNaturals Cocoa syrup. Why not enjoy a delicious chocolate flavored dessert by replacing sugar with no calorie, no unhealthy additives Cocoa syrup/sweetener? Here's my chocolate banana cupcakes where I didn't use a single grain of sugar but yet it turned out moist, sweet and not bland nor sugary and smells so good. After baking, I let 7 people try the cupcakes in exchanged for their honest opinions. The lady from my church said she can taste the chocolate and the banana. She loves the peanut toppings but suggested to try chopped pecans and mix it with the batter. Her grand daughter agreed with her about the taste. My neighbor and his kids noticed the chocolate and banana flavor right away. They loved it and was amazed that there was no sugar on the cupcakes. My friend who is currently conceiving, sent me a message on Facebook right after she tried it. She said it's delicious, moist and she loves it so much. My hubby is not crazy about it only because he is not a banana person but he thinks that other people will like it. LOL. So, if you love banana and chocolate, I wanted to share this so you too can enjoy and satisfy your sweet tooth craving without the added sugar. This recipe makes 24 pieces regular size cupcakes. Preheat the oven to 325°F(162.7°C). Prepare the tray by lining up 12 pieces of cupcake paper cups. In a large bowl, using an electric mixer, mix together the NuNaturals Cocoa Syrup, butter, banana, vegetable oil, eggs and NuNaturals Vanilla. Mix until smooth. In a separate bowl, whisk flour, baking soda and salt. Add the dry ingredients to the wet ingredients. Mix for 2 minutes until it looks fluffy, light and moist. Scoop or pour the batter into the cupcake paper cups up to 3/4 full. I suggest you use ice cream scoop and spatula. Distribute evenly, sprinkle the roasted peanuts. Bake for 20 to 22 minutes or until toothpick inserted in the center comes out clean. Remove from the oven and let it cool for few minutes, then transfer it to a wire cooling rack. Tips: Leave the cupcakes on the kitchen counter overnight, it absorb moisture from the air and makes the cupcakes moist. Let me know how yours turn out and feel free to contact me if you have questions. Disclaimer: This is not a sponsored post. I received the NuStevia Cocoa syrup and Pure Liquid Vanilla NuStevia from NuNaturals for free for testing purposes. However all opinions expressed were exclusively mine and my friends and not influenced by any means. These look so good, I have never tried NuNaturals. Those look really good. You can send a couple my way. lol. Sounds like they would be good for you too. The less sugar the better for me. Can I have some please? I think baking is not one of the many things that we have in common sis, I hate baking lol. Nice recipe for cupcake, but if you adjust the wet ingredients, it'll make good cookies. That looks really good. I have the same product too and haven't done a review yet. I miss eating cupcakes. :) Hmmm.. looks yummy! Send some my way please, looks delicious! The chocolate banana cupcakes looks really tasty. Oh my this looks yummy!!!! I want to taste some of it hehe. Can I jhady??? Looks easy and yummy enough! Who doesn't enjoy a good cupcake. Thanks for the post! I just said to my wife, these look so good. check them out.. thanks for recipe we may attempt it if we have time this weekend.. These look like some yummy cupcakes can't wait to try the recipe. Thanks for sharing. Ooh if only I was a banana person! I have a feeling my Mom would love these though. Looks delish! I might try but substitute with coconut flour instead. That looks amazing! I love the combination of bananas and chocolate. looks delicious. I am always looking for ways to use up bananas. thanks! Ohh chocolate and banana! My favorite! I also use stevia, but I haven't tried this version before. I'll check it out. Should I expect mine in the mail or do I come over? jk. That looks delicious, my mom love to make cup cakes, i will going to share this to my mom. This looks yummy and easy to do at that!! 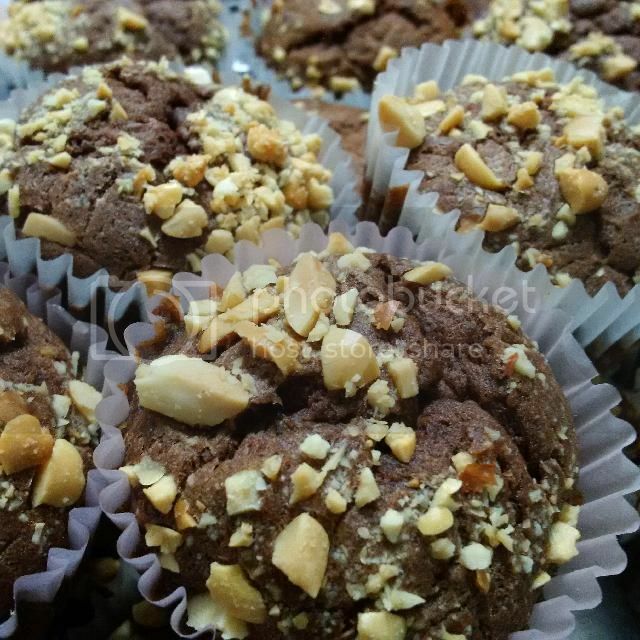 Not a big lover of chocolate muffins, but I love experimenting with tastes! I got my box from the giveaway and have been looking through recipes, just haven't had a chance to make anything yet. Those sound amazing. I think I need to whip up a batch of those asap!! Looks super moist and cakey and yummy. Three of my favorite adjectives when describing a muffin. Great recipe. I love that there isn't sugar! This looks fantastic! These Chocolate Banana Cupcakes look so yummy! Thanks for sharing the recipe! Can't wait to make these! Looks delicious I really need to try these tasty cupcakes! I need to try out the NuNaturals NuStevia Cocoa Syrup. Sounds like it is right up my alley! Wow, I haven't seen that product before. I usually use coconut sugar when I bake but I'll have to check this out. These look so moist and delicious! Thanks for sharing this recipe! I have converted to stevia a while ago but I had no idea about the cocoa syrup. I cannot wait to try this. Chocolate here I come! I have heard of Stevia on some blogs but chocolate syrup that is sugar free AND tastes good? I am so excited to try this. Oh, I love my sweets and I'm always cutting back on the sugar content, but will never use the artificial stuff! This cocoa syrup sounds awesome! I'll have to give it a try! Yum. I love Chocolate and Bananas together. This looks terrific. Banana cupcakes!! Yummm that combines a couple of my favorite things! I recently baked a Choco- banana cake and my niece just loved it!!! I love chocolate and I love banana's so why not mix them together and make cupcakes?!?! I love it!